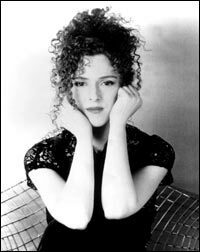 I caught up with the red-headed hurricane called Bernadette Peters in her home in New York on a Monday morning just as a huge storm was settling in to blanket the northeast with yet another taste of winter. The storm didn't bother her though. "I like rain. I find it peaceful. When I was in high school, I didn't like it because I have naturally curly hair and those were the days of straight hair! I'd think 'Oh no! My secret is out!' Ha!" It's been no secret that she has been busy, busy, busy. The last year has found this titian-tressed temptress keeping her curls intact while getting married for the first time, making her Carnegie Hall debut, releasing not one but two new albums after a fifteen year studio hiatus, sirening through a historical TV drama for NBC's May sweeps, getting nominated for a Grammy and jetting back and forth across the country on a concert tour that has crowds begging for more. All the while, the on-line world is burning up bandwidth debating what this Broadway Baby's next move will be on the Great White Way. You and I are February bookends. I'm the first and you're the twenty-eighth. My mother was the first! Really? Do you know who you share a birthday with? Tommy Tune, I knew that. And, your old co-star, Tom Aldredge. That's right. I knew that. I love it. It's so nice to have a support system like that. I'm so lucky, because he [Michael Wittenberg] is an investment advisor so he can take his computer and come with me on the concert weekends. Have you ever gone out on the Internet? Well come to the Stephen Sondheim Stage because the people are talking about you! The rumor is Annie Get Your Gun is your next Broadway show. What say you? Oh, um. It's nothing to talk about yet. So you really are going to hold out and give the scoop to Rosie? Ha-ha! It's nothing to talk about yet. Okay. Next rumor. That you're not going to be doing 'Animaniacs' anymore. I don't know. I did one a couple of months ago. Are you the person who's responsible for slipping all the Sondheim references in the show? No. (Laughs) The writers are very clever that way. Wonderfully. I was just in Chicago and it was just really exciting. It was like Carnegie Hall. The audience was very excited. So that was lovely. Do people call you "Bernie"? So you don't like it? Like Elizabeth Taylor hates being called "Liz". Oh, she does? She likes "Elizabeth"? Well it is a beautiful name. So, let's talk some Sondheim. You are being called the premiere interpreter of the music of Stephen Sondheim. How does that feel? Gosh, really? Well, that's an awfully nice compliment. I don't know whether it's true or not. (Laughs) I mean, it's a beautiful compliment. Where do you think that came from? I think it comes from the fact that you do such a phenomenal job with his songs. Well, I do love his music. I love singing his songs and getting involved in his words. A lot of people feel the same but they fail miserably. Why do you think you're being so successful with them? Gosh, I don't know. They just ring very true to me. His songs make so much sense. They have such depth. There are layers and layers and layers to his songs. You sing a song and the next time you sing it it can mean something else totally. It's like this beautiful Maui onion that you keep peeling and there's all these layers and layers and layers and layers. Betty Buckley, whom you replaced before Into the Woods opened, told a story recently saying she had sent Sondheim the CDs of his songs that she had recorded and he said that he didn't like them because she didn't sing the notes the way he wrote them. Oh yes, I understand that. He writes the music and the lyrics very specifically, saying what he wants to say by making it a quarter note or a half note. He leaves room for passion ...(Laughs)... but only in certain places. When he's writing a show and you're performing his show he wants it done a certain way. I understand that because he's writing that way for a reason. And if you ask him, it's a very good reason. It makes perfectly good sense. But he does like his lyrics correct and his notes correct. People say that he's hard to perform and to understand. How do you respond to that? He can be very hard to learn. It depends upon the song. It's always the unexpected. He'll choose a note, and you'll go back and think, 'Oh, that's the note!' He always writes a little bit just not quite what you think it's going to be. When we did the ten year reunion of Sunday in the Park With George I really had to learn it again. I thought, you just can't bop through this. It's not easy. You really have to learn it. We're going to do a ten year reunion of Into the Woods. We'll see what that's like. Although that was an easier score for me to learn. Except there is the rap song. (Laughs) So we'll see. I know I have to re-learn that! What would you say is the most difficult Sondheim song you've performed? Do you remember one that came particularly easily to you? Yes. Such a beautiful song. Do you prepare for Sondheim differently than you do for other composers? No. There's so much emotion in them. It's a pleasure to prepare those songs. There's so much going on. It's never boring. There's so much to think about. It always takes my interest. I love it! When did you first become aware of Sondheim's work? Well, I was always aware of it but I wasn't aware how much I loved it until I went to see Side By Side By Sondheim in London with my manager, Tom Hammond. And there were all his songs, one after the other, and I couldn't stop singing his songs. I went away humming the songs. Which they say you can never do! That's right! But I did! I loved it. Do the individual songs reveal more to you as you perform them? You performed 'Move On' for the first time in 1984 and you've just recorded it again. They do. When I was first playing that role I thought, 'Well this is a nice song. It's about getting him to move on.' Then all of the sudden 'boom' - every night it became like meditating to sing that song. It was like a high. I would wait for that part of the show every night. It would mean so many things. Life was going on around me. I would have friends that things were happening to and it would be about them, and it would be about me, and it would be about life. Legend has it that you said yes to Sunday in the Park with George based on thirty pages of script and one song. What did you see that hadn't been written yet? It just seemed the perfect thing to do. It was a workshop. I'd always wanted to be in a Sondheim show and here was an opportunity just coming to me. It was a period piece, which seemed great. When I read the treatment I thought, 'Oh Mandy Patinkin would be great for this.' I didn't know him at the time but I asked James [Lapine] who was doing the other part and he said Mandy Patinkin. And I said, 'That's so funny. That's who I thought of when I read this.' It just seemed so perfect to go off and do. And since it's a workshop you're not committed to it unless you want to be when they go to Broadway. What was the workshop process like for you in such a high profile piece? How was it being seen, not just by the theater party ladies from Queens, but by your peers since everybody was trying to get into that workshop. It was great because we knew it was really wonderful and special and the audiences loved it. They loved it. Were there any songs cut from the show that you remember, or miss and wished that you'd been able to keep? No. We only did the first act in workshop. On the last Saturday we did two performances of the second act. So Steve kept adding songs not taking away songs. And then when we did the show on Broadway I think everything stayed and he kept adding more. How much did you contribute to Dot's or Marie's character development? Not that much. I believe that the writers write the show and the actors interpret it and contribute in that way. I had mentioned that I thought she should be as strong a person as George. I think she's a great character, a great woman. I was thinking about her today, in fact. I like her because she had great dignity. She was smart and had great insight. She knew that he couldn't be with her because of how important his work was. And yet, he didn't want a woman who didn't understand how important his work was so, you know, he was in a bind. She had to make a choice to move on. And then she comes back and teaches him that. It's so beautiful. Do you think the show would have stood on its own as a first act only? As a one act musical? Oh, I'm so glad they didn't do that. It has so much to offer in the second act. So much to offer in the second act. [A one act] would have been the safe thing to do. And James Lapine has never worked in a safe way. God bless him for that! If you were to play Dot today would you approach the role differently? No, I don't think I would change anything, actually. I would just have more fun with Marie, which I did at the ten year reunion. Why did you leave the show before it closed? I was offered something else, I think. Oh, I left to do Song and Dance. I took that message of 'Move On' and I learned and I moved on. I came back the day the Pulitzer people came. It was after I had already left, but it was only a week later, and I came back and I did that performance. And it was a thrilling performance. My last official performance was also thrilling. The audience knows. If they're a fan of a show and a performance, they know the show, they know all the lines and they know all the feelings. [That night] was like they were up on the stage with me and I was in the audience with them. It was 'you know and I know, and I know...' and it was such an interesting feeling. And yet, you're in the moment, too. And you're letting them really be in the moment with you. It's very interesting. I notice you haven't changed your bio yet, as you promised... or your agent hasn't! I promise I'll fix that. You've said that you avoided listening to a lot of female singers, so as not to be influenced by them. What do you think it is that makes your voice and your style so unique? Well I don't know. I had an acting teacher years ago who always said, "There's only one of you in the world. There's only one." So I was taught to be, what's the word, pure... true. Yes, true. Not to copy anyone, ever. So hopefully, what comes out of me comes out of me naturally. I try to interpret things the way I feel them, not the way I think someone else wants to hear them. How did you pick the songs you used for your concert and album?